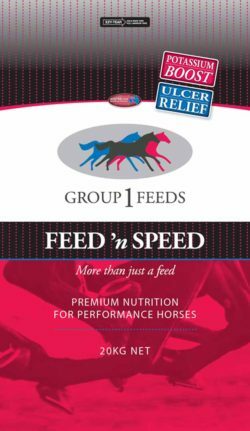 Feed’n Speed is a muesli blend containing steam flaked grains specifically formulated for thoroughbreds, standardbreds and performance horses. It’s a perfect feed for daily-trained horses in light to intense work and racing or competition horses. It can be fed alone or blended with other unfortified grains or protein supplements. Feed’n Speed is based on steam flaked; cracked corn, triticale, flaked barley and flaked lupins, black sunflower seeds, molasses, calcium carbonate, vitamin and mineral premix. Use the above feeding recommendations as a guideline, if in doubt contact a veterinarian or equine nutritionist. Introduce feed gradually over 7 – 14 day period and divide total feed into multiple meals. Measure feed in weight not in volume. Total daily feed intake (roughage and concentrates) of light to moderate working horses should be 2.0-2.5% of the bodyweight and for moderate to heavy working horses 2.5-3.0% of the body weight. Feed intake may vary depending on the age, workload and climate therefore monitor your horse’s body condition and weight regularly. Reduce amounts of Feed’n Speed on off days. Fresh and conserved forages (roughage) should be provided at a minimum of 1.0% of the bodyweight. Ensure you monitor pasture conditions of your paddocks and adjust feed accordingly. Feed’n Speed has no added salt. Supplementation with electrolytes is recommended during periods of heavy sweat loss. Feed’n Speed is available in 20kg bags. Store in a dry and cool place, protected from sunlight.